The words of one of my favorite songs starts like this, “Make me broken so I can be healed…..” That’s exactly where I was about two (2) years ago. I was broken. The song’s lyrics say, “Make me empty so I can be filled….” I was just about as empty as I could have ever imagined; empty in my eyes, maybe not in God’s, but in my own I was beyond empty. The chorus of the song is powerful to me….. “Til You are my one desire. Til You are my one true love. Til You are my breath, my everything. Lord, please keep making me….” It’s seemingly taken me forever to realize that God is my one true love! That He has never given up on me and that He constantly and consistently is my one true desire! A few days ago (Friday 8/29) I was struggling. I was having a bad day, I was over whelmed, and I just felt alone. That’s when it happened; that’s when God showed up…… A few months back, when my mom was in the hospital for her first surgery with the colon cancer I experienced something powerful. Every day, for 25 straight days, I heard that song. It was usually as I pulled into the parking garage at the hospital. After about 5 days in a row I began to wonder if it was just a coincidence, or was God maybe there in the car with me. I drove different cars, took different routes, I even tested God and turned the radio off, but still the song was there. It would bring me to tears and I would feel every word as if God was speaking each individual word to me. On day 25 I got nervous…… I was parking the car and no song. Just as I went to turn the ignition off it started playing. Teary eyed I prayed and told myself I would never listen to the radio again on the way down there. Day 26 never happened, my mom came home. Today I came full circle with that song…..
After leaving my office (Friday 8/29) I got in my car and ran some errands and just as I normally would I turned the radio on. Just as the sound came on, the song came on. I was in tears to the point that as I sat in traffic, at a red light, I was too consumed with my tears to notice the car to my right. We were side by side….. A mother driving one of those fancy SUV’s, with a three, maybe four year old little boy in the back seat. He was sitting behind her seat….. Not sure why, I always liked me kids on the opposite side, but whatever, my OCD isn’t part of the story! The kid and I locked eyes and as we did he began to cry, I could visibly see his tears. He saw mine and when he did he put his hand on the window, almost like he was wanting to hold my hand. I stretched over to my passengers window and spread my palm onto the window just like his. We literally sobbed together in that moment and I felt God’s presence warm over me. It may have only been for as short as 30 seconds or less, but I felt it. The image of that little boy is forever etched into my heart. I had my blog written already, just waiting for today to get here…… It’s been almost two (2) years since my baptism and that’s what I wanted to share. God stepped in…… To that little boy, whereever he is, thanks kid you absolutely made my day! Author Ryan McKinneyPosted on August 31, 2014 Categories Daily Bible ReadingLeave a comment on Thanks Kid! I walked into a christian book store a few weeks ago, looking for something new to read, something to inspire me, something to wake me up! You know the drill….. Walk in, look around, go to the discount section, then look for something that grabs your attention. I’ve always had good luck with books; they’ve always jumped off the shelf at me for whatever reason. I love reading stuff that I can share, so here ya go! Kyle Idleman is a best selling author and I first heard about him when my small group at church studied his book/video series, “not a fan.” It may have started as a message, but not a fan. has sparked a movement all over the world. More than a half a million books have been sold and more than 10,000 churches have used the video curriculum. That’s powerful. Oh yeah he is also the teaching pastor at Southeast Christian Church in Louisville, KY. One of the largest churches in the country with nearly 21,000 in attendance every weekend….. The book I’m reading right now is called “AHA….” Awakening. Honesty. Action. I think Kyle Idleman is brilliant. We’ve come to our final piece of armor. We’ve learned how the Belt of Truth holds all of our armor together by being constant, pursuing, and ever there. We’ve learned to guard our hearts with the Breastplate of Righteousness for from our hearts flows the wellspring of life. We’ve learned that our minds are guarded by our the Helmet of Salvation provided by Christ’s work and sacrifice for us. The ability to stand firm on the promises of the Gospel of Jesus Christ is provided by our Shoes of the Gospel. Our Shield of Faith allows us to defend against the attacks of the unholy trinity. The world, the flesh, and the devil. That brings us to the final piece of armor. The Sword of the Spirit which is the Word of God. In Genesis, three verses into the Bible, God speaks. God speaks and what happens? Creation. He speaks things into existence. God’s spoken word is powerful enough to create all that we see around us including ourselves. The spoken word is a powerful thing. As we are created in the image of God or in the resemblance of God we too hold power in our tongues. We can speak calamity into existence or peace into a situation. We can provide a caring word and enthusiasm or we can withhold that joy from others. Have you ever said, “That person’s energy is so ________.” You fill in the blank, but your perception of that energy comes from that person’s ability to speak it out. Thousands of years, multiple human authors, 66 different books, one Divine Author and we have the Word of God. The Written Word of God. People have long since refuted the Written Word and I suppose they will for years to come. However, that does not, cannot, and will not change God’s power. For those of us that believe in God Almighty we have seen the Written Word play out in our lives. We learn about God’s character, His loving mercy, and grace when it comes to His children through the Written Word. 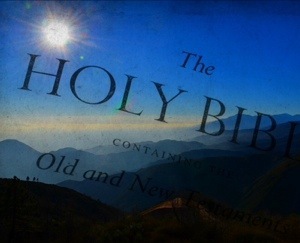 Chapter after chapter and book after book of the Bible, we see God show up and it permeates the chapters of our lives. There are things written in the scriptures thousands of years ago that are still relevant in today’s world. Yes, the Written Word is POWERFUL. That first five verses in the Gospel of John tells us that Jesus is the Living Word of God. Jesus was there the whole time. He has always been there and always will be because Jesus is part of the Trinity. Let’s go back to Genesis and take a look at the Word of God, Jesus, from the beginning. The Word of God or the Sword of the Spirit is eternal. Jesus is Eternal. Ok, ok. We know that, but what does that have to do with the Armor of God? Great question. When the enemy is attacking you must utilize the Word of God as we’ve been equipped by God’s Grace and Mercy. All of it. The Spoken Word, The Written Word, and call on the Living Word. For those of us in Christ we are equipped to speak out against attacks on the Kingdom of God. If we are in Christ, our kingdoms and domains are a part of His Kingdom. Made in God’s likeness we are given the power of the Spoken Word through Jesus’ work and sacrifice. We can squash the enemy by speaking good into existence and bad out of existence. What do you say? No better place to look for something to say than the Written Word itself, the Bible. Quoting scripture is a powerful weapon against evil. Countless precedents are set in the Bible where God aided mankind, built up the hearts of man, and defeated evil. You need but look. There are plenty of scriptures that will relate to any situation you face. When you are experiencing a spiritual attack, look in the Bible for similar attacks on people. You Version and BibleGateway.com both have powerful search engines that can lead you to places similar to what you are going through. Find that scripture and SPEAK IT OUTLOUD. When God created the world, the Bible doesn’t say He thought and it happened. It doesn’t say He whispered or wrote it down. It says that GOD SAID. He spoke outloud. If you feel a little impish the first time you do this you are normal. But it also speaks to how out of touch we are with the power granted us for His behalf. Dear Lord Jesus, thank you for the power you’ve given me in your Word. I ask you to come into this situation and moment and help me. Show me how to fight for you and myself. Thank you for the protection you have provided, gently help me understand how to use through the practice I gain today. You could also simply say, “Jesus, I invite you into this.” It’s up to you. The important thing is that you invite Jesus and BELIEVE He will show up. He always has, always does, and always will. Thank you for joining this series on the Armor of God. If you have any pointers or questions, please feel free to contact me here via the blog. I invite you and your feedback.